Doris Pilkington’s traditional name is Nugi Garimara. 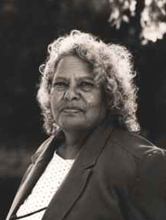 She was born in 1937 on Balfour Downs Station in the East Pilbara, homeland of her Mardu ancestors. As a toddler she was removed by authorities from her home at the station, along with her mother Molly Craig and baby sister Anna, and committed to Moore River Native Settlement. This was the same institution Molly had escaped from ten years previously, the account of which is told in Follow the Rabbit-Proof Fence.